Livestock operations appreciate the convenience, quality and value of POET wet and dry distillers grains. As the ethanol story has unfolded across the rural Midwest, the increased number of biorefineries have offered farmers in the region a convenient, localized way to add value to their corn crop and utilize an economical, high-quality protein source for livestock. But the advantages don’t stop there. 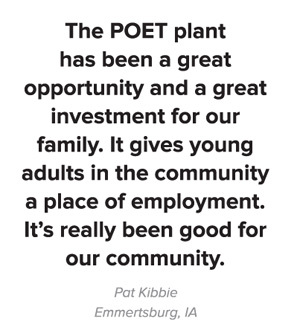 For rural communities, a local POET biorefinery – there are 28 plants stretching across seven states – brings jobs, opportunities for investment and economic development. Few know the advantages of a local biorefinery more than Dave Poppens of Lennox, SD. Before the POET plant opened in nearby Chancellor, not far down the road from his operation, Poppens was hauling in distillers grains for his cattle from a plant nearly 100 miles away. Built in 2003 and expanded five years later, the Chancellor plant sits about 20 miles southwest of Sioux Falls, SD, in the heart of the state’s corn country and is the largest of POET’s plants. Over 35 million bushels of locally grown corn go into processing about 110 million gallons of ethanol at the plant on an annual basis. 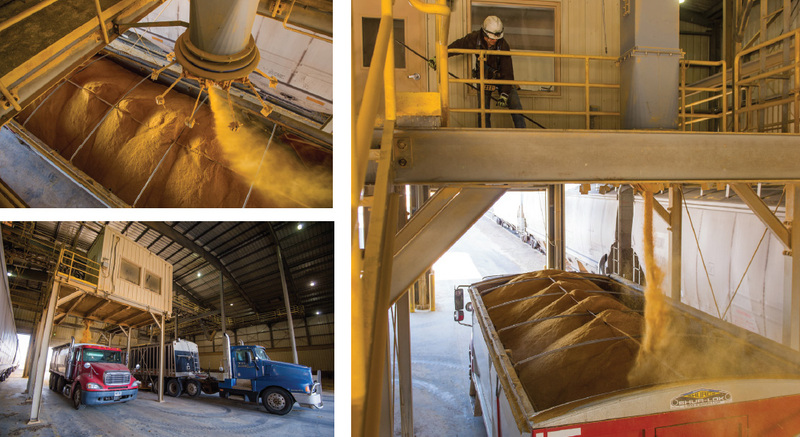 The plant produces about 240,000 tons of POET’s premium distillers grains (DDGS). The plant’s close proximity to his operation isn’t the only advantage to feeding the wet distillers grains. Poppens points out that for his cattle rations, distillers offers a high-quality, cheaper source of protein than relying entirely on soybean meal. Palatability is also a plus. “With cattle, especially feeder cattle, it is easier to keep them on feed with wet distillers, I guess because it is a wetter product that tastes and smells appealing to cattle,” he says. Pat Kibbie, Emmetsburg, IA, also understand the importance of being able to source a value-added feed source without wasting hours on the road. “We began feeding it as soon as the POET plant was built, taking distillers out of Emmetsburg as soon as it was being made,” he says. The back haul reduces the overhaul cost of trucking, which he estimates to be about $10 to $15 per ton. He also feels the distillers grains are priced competitively compared with other protein sources. Along with his father and brother, Kibbie farms a corn and soybean row crop operation. They buy cattle weighing 550 to 700 lbs., then finish them at three locations. He also keeps a small cow herd, raising club calves for show. Kibbie says the Emmetsburg plant always has a constant supply of high-quality, wet distillers, and does a good job of getting them in and out quickly. “The cattle seem to stay on feed, even during adverse weather. Whether too cold or too hot, they seem to eat the same amount,” he says. He credits the constant supply of high-quality wet cake for the influx of cattle operations from southwestern states like Texas. “With the cooler weather here, shelf life is longer,” he explains. Consistency of the product has been good, according to Kibbie and he says they have become adept at handling the wet product during cooler weather. If it is going to be below freezing, the surface of the pile of wet distillers grains is covered with tub-ground hay, about five or six inches deep. While originally done to reduce feed loss during cold weather, Kibbie says they have discovered it can also be helpful in warm-weather months, reducing exposure to direct sunlight. Staying consistent hasn’t been a problem, as Ruggles has had no trouble get distillers. “Cattle seem to like it. It’s like putting candy in the feed for them. It brings the cattle to the feed bunk,” says Ruggles.